If you follow technology news, then you can probably still recall discussions about Microsoft’s plan to acquire roughly 20 Web 2.0 companies every year. This was stated by Steve Ballmer several days ago and CRN later reported that open source companies were at hand. Let’s look more closely at some further analysis. With the Yahoo! acquistion of Zimbra for $350 million and the Citrix acquisition of Xensource for $500 million is there an impending feeding frenzy for open source companies? It wasn’t that long ago that Red Hat bought JBoss and Oracle acquired Sleepycat. Maybe these are just the beginnings of a bigger trend. So back to the boys from Redmond, so who does Microsoft buy and why? Well I would think you need to discount the database market, they wouldn’t want to compete with MS SQL.They probably would stay away from CRM because of Microsoft Dynamics. Having just received a lot of information on standards, there are many other consideration to weigh and introduce here. One might argue that Microsoft wants to acquire key Web companies and convert them to Microsoft technologies such as Silverlight. It’s part of the hijack of the Web, i.e. making W3C irrelevant. They already achieve something similar with Novell (Mono, Moonlight, OOXML, and so on). “It’s part of the hijack of the Web, i.e. making W3C irrelevant.”As mentioned yesterday, Silverlight has just had antitrust scrutiny invoked in the united States. Another news source described this move as “Joining the Team against Microsoft”. The Big Boys may be “teaming up against a monopoly”, but in the mean time, us the ‘little people’ — as opposed to state governors, diplomats, and regulators — can do relatively little for change. If you want to join a team that opposes abuse of control, then help the FSF, EFF, and make a difference by individual action and word of mouth. Tomorrow’s digital future is at stake. OOXML/Silverlight/SharePoint and Web 2.0 acquisitions are all part of overhauling the Web and getting another set of shackles on ordinary people. Be very aware of this. 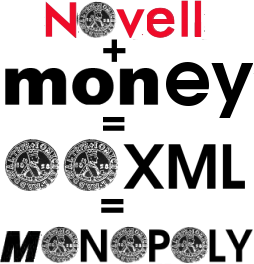 As for Novell, the company just plays along. It did receive a lot of money to do so. It is sometimes cheaper to buy a competitor than to produce a product that beats that competitor.